The lengthy flight to Pittsburgh (complete with a layover in Las Vegas) allowed me enough time to watch Slap Shot on the plane, in an attempt to familiarize myself with as many of the filming locations as possible. I rented a car at the Pittsburgh airport and drove through the night to Johnstown, arriving just after midnight. Even though I’ve spent years navigating the intense Los Angeles traffic, I must say that driving through the winding roads of western Pennsylvania was even more maddening. I passed out almost as soon as I checked into my hotel room. SLAP SHOT fans might recognize this dog statue from a memorable scene in the film. The chilly weather was starting to get to me on this cloudy day, so I made my way inside to the Johnstown Flood Museum, one of the town's major attractions. I was absolutely enthralled by the devastating story of the massive flood that decimated the town in the late 19th century, and the museum does a great job of providing visitors with a vivid portrait of small-town life during that era. I spent most of the early afternoon at the museum, slowly absorbing the stories of the bygone time. But now it was time to walk over to Cambria County War Memorial Arena, home of the NAHL's Johnstown Tomahawks - but more importantly, the primary filming location of Slap Shot. 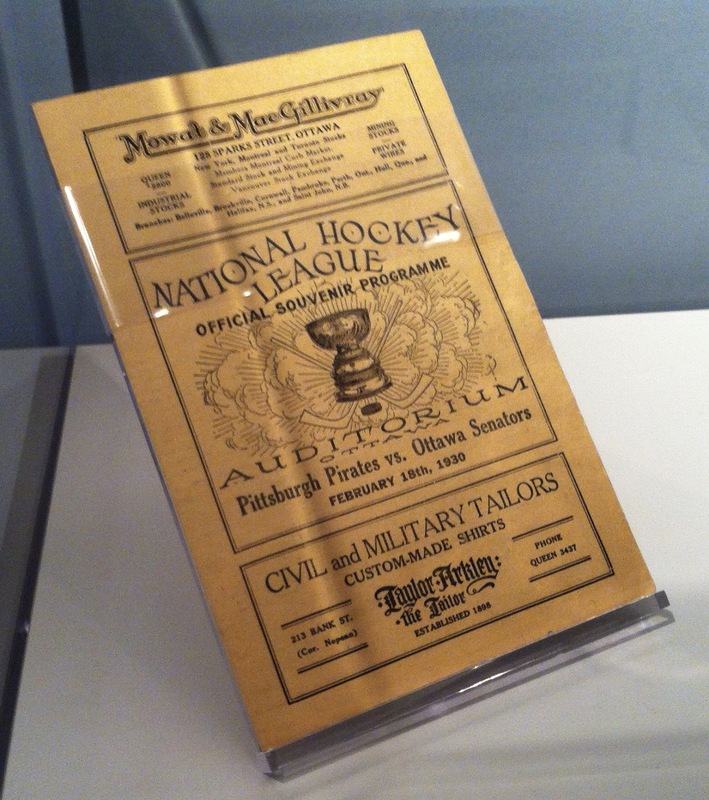 It had recently been named as the first winner of the Kraft Hockeyville USA competition, which included upgrades to the arena and the chance to host an NHL preseason game (I'm sure the connection to the popular movie helped the town's chances). It was all too fascinating. I couldn't really sit still during the game, as I found myself so much more interested in simply walking around the arena to see every corner. It was an afternoon I'll never forget! After the game was over, I walked back to the hotel to meet my friend Julie, who had driven down from Rochester on her way home for the holidays. On the advice of the hotel desk clerk, we went to Franklin Street Bar & Grill for a delicious dinner, spending several hours catching up before calling it a night as the bar closed. This was my day to go sightseeing, so I drove into Pittsburgh and went directly to the Fort Pitt Museum, located downtown at the confluence of the Three Rivers (Allegheny, Monongahela and Ohio). The museum sits directly on the spot of a Revolutionary War-era British fort, and features a rich and detailed history of the city - I spent nearly the entire afternoon on the premises. Struggling to keep warm, I got back in the rental car and left downtown to check into my hotel. Nici, a longtime friend from Los Angeles who had been living in Pittsburgh for several years, invited me to join her and her husband for dinner at Vincent's Pizza Park. More delicious food and more great conversation ensued - the trip was going well, and it had only just begun. 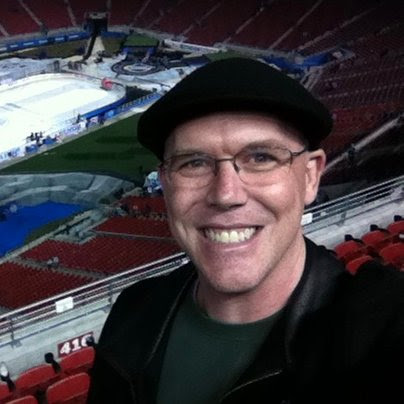 Another day for sightseeing, but this time I would cross the state line into Ohio, and make the 2-hour drive to the prestigious Pro Football Hall of Fame in Canton. I've always want to visit and I gave myself nearly four hours to cover the grounds, but it still wasn't enough time. 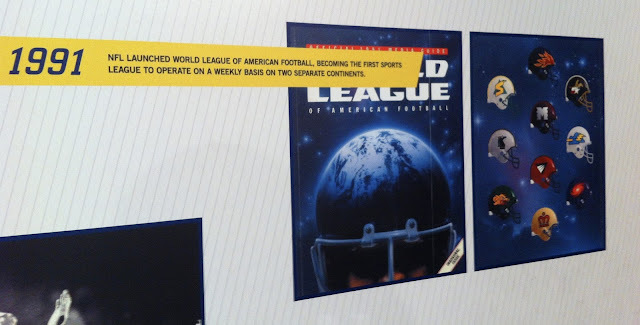 I was captivated by virtually all of the exhibits and took particular interest in the obscure history of the "alternative" leagues that have been formed over the years (such as the USFL and World League of American Football). I was fond of the Buffalo Bills when I was growing up, so it was nice to see the team well represented, especially in the awe-inspiring room filled with the busts of the enshrined players. I cannot recommend this enough to any sports fan - it's truly a sight to see. Yes, Tim Tebow is "in" the Pro Football Hall of Fame. That is still one of the greatest games I can recall. My favorite player when I was growing up. I was able to buy some souvenirs as the museum was closing around me, and then made my way back to Pittsburgh to meet up with Tony and Kasey, who had driven up from Dayton while I was away. We grabbed a quick dinner at the Central Diner and Grill next door to the hotel, before wrapping up the night by hanging out in their room until the late hours. The busiest day of the trip. Chad had taken a red-eye flight from Los Angeles and arrived at the hotel early in the morning. 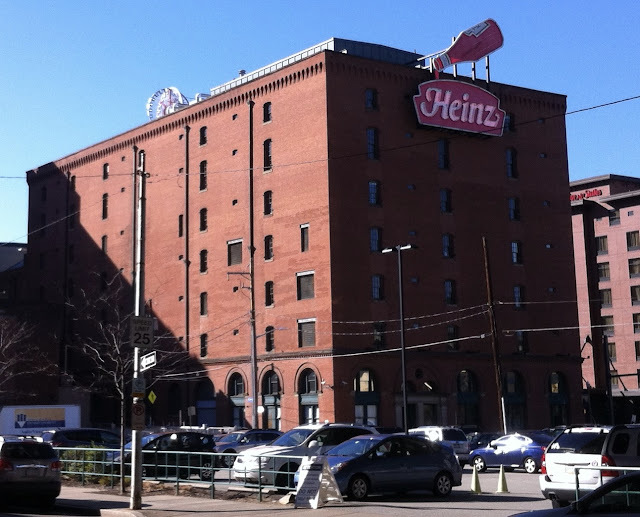 We met him at the diner for breakfast, then went downtown to see the Heinz History Center: yet another museum dedicated to the history of this vibrant city. 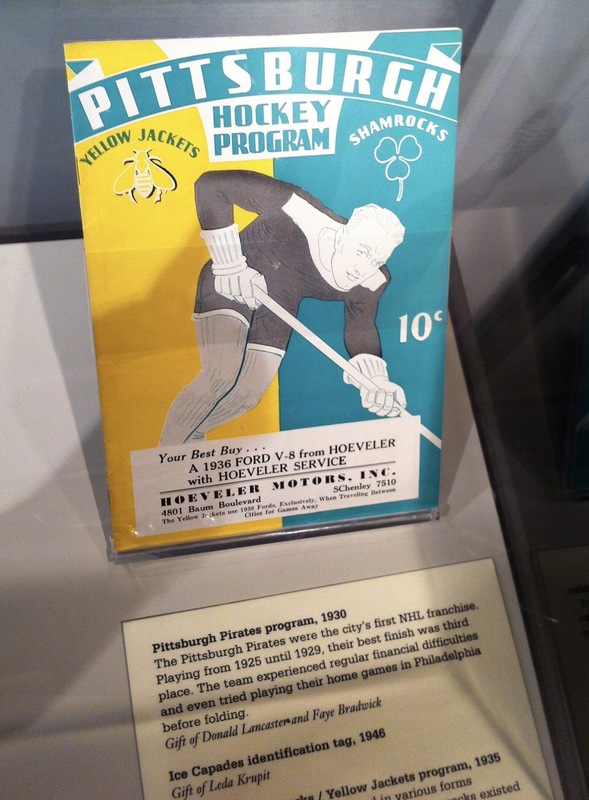 Once the museum closed, it was time to drive across town for some hockey. It was pitch dark by the time we arrived (stupid Daylight Savings! ), but we were able to briefly walk around outside the arena to admire the Mario Lemieux statue out front. 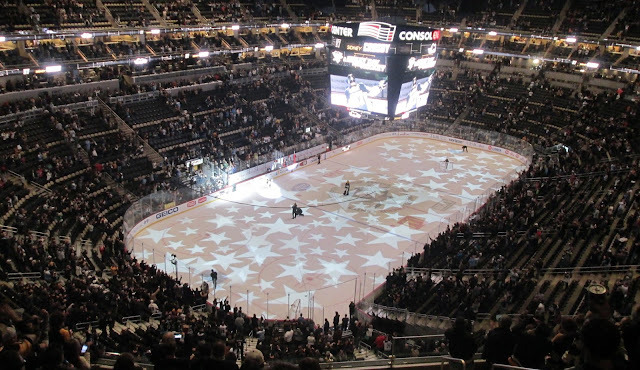 Once aside, I was amazed - this is one of the most beautiful arenas I've seen, and has become a prototype for many of the new buildings being constructed across the league. The concourses were wide enough to accommodate all of the fans, the team store was huge, and there were plenty of photo ops along the way. It just so happened that the St. Louis Blues were the visitors on this night, so I thought I'd show them some support by wearing my jersey. It was a bit of a ho-hum game to start, which was likely considering that there isn't much of a rivalry between these two teams. 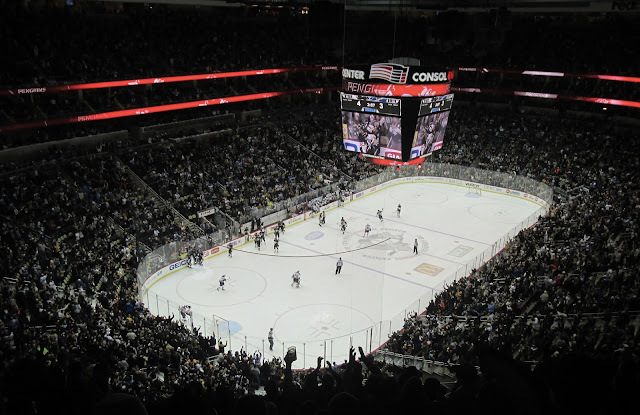 After trading goals in the 1st period, Sidney Crosby scored his second of the game to give the Penguins a 2-1 lead going into the final period. That's when the game really took off - maybe Rodney had something to do with it! Overtime. 3-on-3. This would be my first time seeing it in person, and it was just as fantastic as I had hoped. 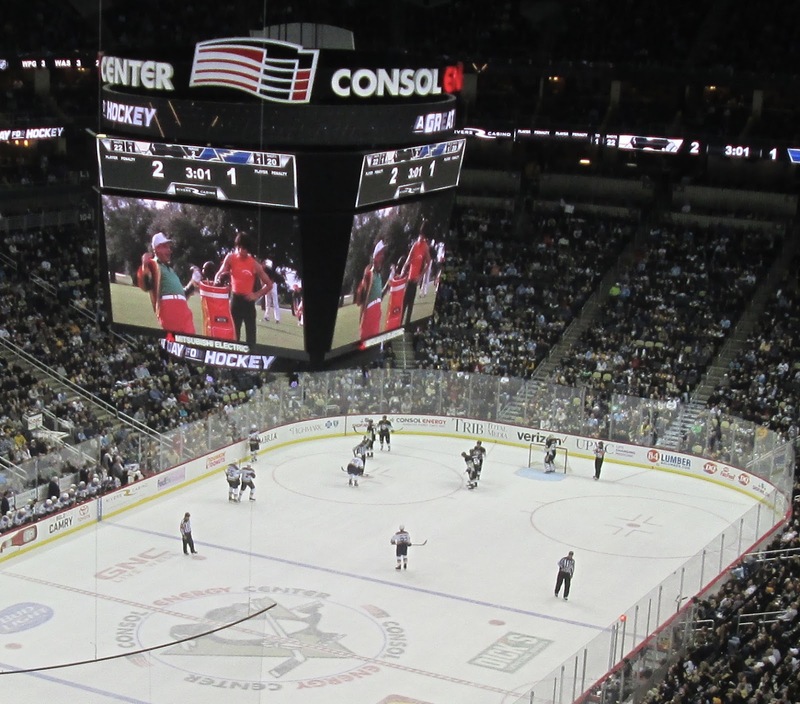 Granted, I wish it would have been longer, as Evgeni Malkin scored the game winner just after the first minute of play - but it was nice to get a glimpse of this new element of my favorite sport. Back to the hotel to get some rest before our early morning drive to Ohio. It wasn't nearly as long as I had hoped, but I had a great time in this wonderful city. So long, Pittsburgh! Morning came way too soon, and we were on the road back to Dayton. Obviously there was no time to prepare a proper Thanksgiving turkey, so Kasey cooked up some delicious "turkey tenders", and we gorged ourselves on a feast that included numerous side dishes. Her mother lives across town, so she was able to join us - along with my sister, who made the 2-hour drive south from her home in Findlay. Considering all of the various sightseeing and traveling I'd done this week, it was great to have a day to relax and spend time with good friends and family, which is what the holidays should entail. We continued walking around the downtown area, along the outskirts of the Ohio State University campus before settling on dinner at Eddie George's Grille 27. Named for the popular OSU running back, this sports bar had a great atmosphere and was an ideal place for some pre-game grub. 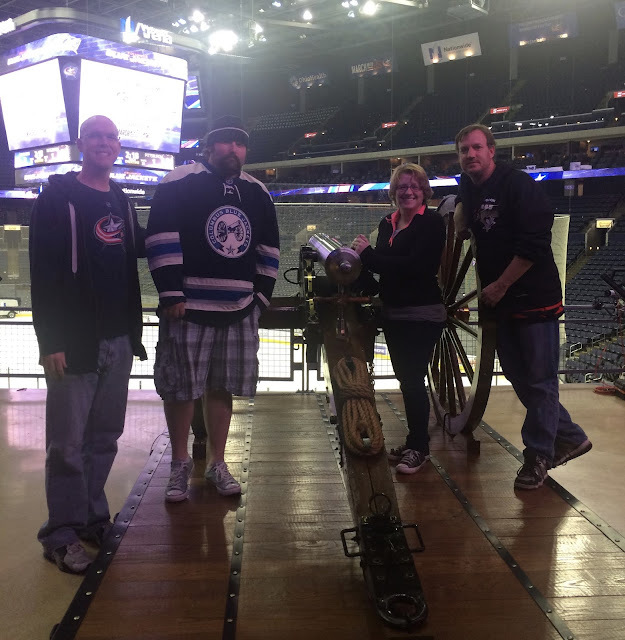 As I've mentioned, Nationwide Arena might just be my favorite arena in the NHL. I love the surrounding area, and the team has done a great job creating an enjoying fan experience. For the second time in three nights, we would get to see the Pittsburgh Penguins, as they made the trip down I-70 to face their divisional rivals. 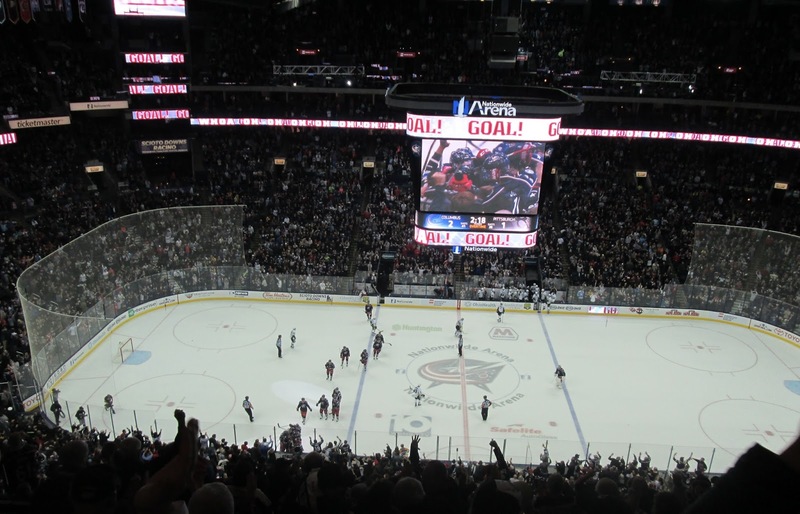 Just as expected, it was a hard-fought contest, with neither team giving an inch - and it got testy, with both teams committing several penalties throughout a chippy first two periods that saw neither team score a goal. Evgeni Malkin finally broke the drought in the 3rd period, only to have Ryan Johansen tie it for the home team shortly thereafter...once again bringing us to overtime. Now that I had gotten my first taste earlier in the week, I was hungry for more 3-on-3 action and it was tremendous. The fans were already on the edge of their seats, and the building erupted when Cam Atkinson netted the game-winner halfway through the extra frame! Two arenas. Two really cool shot glasses to purchase. And since it was the holiday season, they even sold commemorative pucks that were date-stamped with the year, so I had to get one to add to my collection.